Kalamalka Lake near Vernon in the Okanagan Valley has been rated as one of the world’s top 10 most beautiful lakes by National Geographic. It is stunning — its clear blue waters that range in hue from aqua to indigo are framed in by ponderosa pine-forested hills to the east and scrubby, rocky promontories to the west. In the middle of this natural splendour sits Kalamalka Lake Provincial Park, a hiker’s and swimmer’s haven with marked trails that lead to secluded bays perfect for a dip on a hot day. Kids and pup enjoy Kalamalka Lake at Pet Beach. We hiked from the main parking lot down to a quiet bay and then up to a rocky lookout that afforded views down the lake and back toward Coldstream, near Vernon. From there it was an easy descent to Pet Beach, a dedicated area where you can let your dog swim. And doggy paddle Piper did. We took her out in the water a few times and let her swim back to shore, where she was rewarded with a treat. Before long she plunged in on her own and swam a lap around Blake. Then Avery threw a stick out for her, which she retrieved, over and over and over again till she was pooped. High: Piper is officially a water dog! And we had the beach to ourselves, a drastic departure from nearby Kal Beach, the local Coldstream summer hangout that teems with people every day all summer. Low: For some reason we didn’t bring swimming suits and Bennett tried imitating Piper’s puppy strokes… with all his clothes on. Outcome: This park is an Okanagan Valley gem. Plan to spend a half day exploring it. Come prepared with water, snacks, swimming suits and a towel or two. 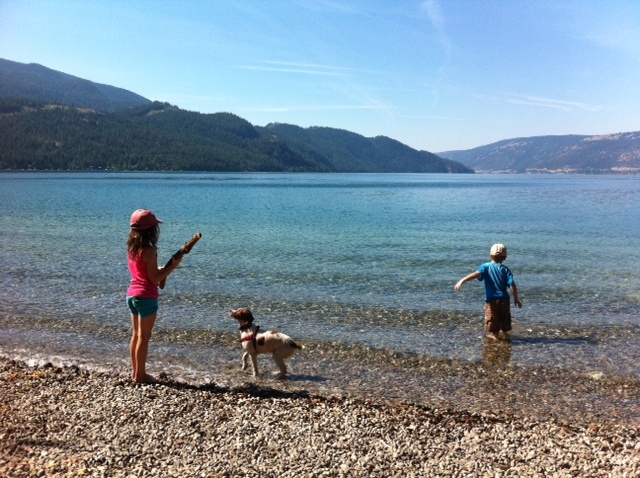 This entry was posted in Travel and tagged BC road trip, BC with kids, explore BC, Kalamalka Lake Provincial Park pet beach, Kalamalka Lake with kids, Things to do at Kalamalka Lake, Vernon with kids. Bookmark the permalink.